The Nigerian Civil Aviation Authority (NCAA) has suspended the operations of IRS Airlines and Chanchangi Airlines in line with its determination to conduct a safety audit on domestic airlines following the plane crash involving an Associated Airlines aircraft in which about 15 people lost their lives. 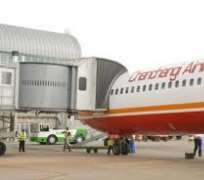 This is also coming less than three weeks after the regulatory agency suspended the operations of Dana Air to enable conduct a review of the carrier's operations. It was gathered that the suspension followed a memo signed by the Director-General of the NCAA, Captain Fola Akinkuotu, ordering all scheduled airline operators whose fleet size had been reduced to only one operational aircraft to immediately stop flight operations. The memo, which was addressed to all scheduled airline operators and dated October 14, 2013, has as its reference number, NCAA/DG/GEN/Vol.II/2013/80. The memo, a copy of which was obtained exclusively by our correspondent on Wednesday, read in part, 'You will recall that recently, the NCAA, through the director-general, expressly suspended the continued operation of airlines possessing otherwise valid Air Operators Certificate, but who were operating with a single aircraft. 'The Nigerian Civil Aviation Authority regulations provide for more than a single aircraft for any operator to secure or operate under a valid AOC. 'This directive is, therefore, issued to formalise and clarify that prior order suspending such operations. As such, all AOC holders or operators whose operational fleet has been reduced to a single operational aircraft for whatever reason shall immediately and forthwith suspend their flight operations. Following the directive, IRS and Chanchangi's operations have been grounded by the regulatory authority. The development has brought to four, the number of airlines whose operations have been suspended by the regulator in the last three weeks, following the Associated Airlines' plane crash in Lagos on October 3. Associated Airlines' operation was suspended by the NCAA three days after the tragic crash involving its Embraer 120 plane near the Lagos airport, which led to the death of 15 people. Two days later on October 6, the regulator suspended the operations of Dana Air nationwide. A top official of the airline said there were three aircraft in its fleet with registration numbers 5N-BMB, 5N-BQZ and 5N-BMC. According to the official, two of the aircraft have gone for routine checks in Belgrade, Sebia and South Africa, respectively, while only one is currently operational. The development, the official said, informed the NCAA's decision to ground the airline. The Managing Director, IRS, Mr. Yemi Dada, said, 'The NCAA has the power to make rules and regulations for the sector. The rules state that you must have two aircraft when starting operations and not two at all times. Dada said the airline was getting an Embraer 145 plane from the Bauchi State Government to bring the number of planes in its fleet to six. He said although only one plane was currently in operation in its fleet due to routine maintenance of the others, he gave an assurance that the carrier would have three operational planes in three weeks' time, and that by January, the airline would have all its six planes operational. At the moment, only Arik Air, Aerocontactors, FirstNation Airline and Overland Airways are left to do scheduled domestic flights in the country. Some stakeholders have applauded the decision of the NCAA to suspend the operations of IRS and Chanchangi airlines, saying the development will boost safety in the airspace. An industry expert, who chose to speak under the condition of anonymity because of the sensitive nature of the subject, said, 'When an airline is using only one plane, there is the tendency to put unnecessary pressure on that only one plane. In India, you must have a minimum of four planes; otherwise you cannot fly. We must up the stake in Nigeria. 'If our rule says only two aircraft, then you must even go beyond two planes. We must not be seen to be operating on the borderline. We should go beyond the minimum standard set by the regulator. This is how to improve air safety. We must not wait until accidents happen before we do certain things.' - Punch.